Easily rotate pallets, skids and other large objects with these rugged powered carousels. 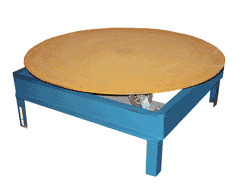 Each unit includes a 48" diameter round smooth turntable. Turntable is supported with inverted casters for use as bearings. Units are complete with turntable, base, 115V single-phase power unit and variable-speed control (electric/hydraulic unit has fixed speed control). Turntable is operated with a foot control. Heavy-duty steel construction. Painted finish.